Jane Parnell is a contributor to Writers on the Range, the opinion service of High Country News. She the author of the mountaineering memoir, “Off Trail: Finding My Way Home in the Colorado Rockies,” recently published by University of Oklahoma Press. It was a Friday night in July 2016, the height of tourist season. But having camped in this gulch for decades without incident — not even a hungry bear — we didn’t anticipate how much had changed since our last visit five years before. We drove past the Forest Service campground, which was, as usual, full, and on up a dirt road too rough for anything but a four-wheel-drive vehicle. Camping was allowed along the road in designated sites. These were the only free sites anywhere near the resort town of Aspen, Colorado, and functioning cellphone service. It was a calm, pristine evening, Venus rising above the trees, the sound of the creek after a long, congested drive as restorative as a Vivaldi concerto — until the guns started firing. 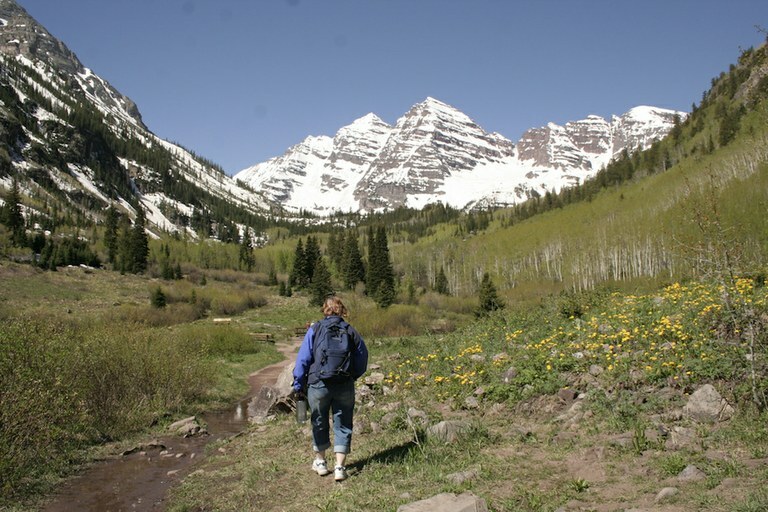 A hiker explores the Maroon Bells near Aspen, Colorado. With ice axes, brought for the climb tomorrow, in hand, my friend Babs and I walked down the road to ask our neighbors to knock it off. By then, their chainsaws had also buzzed into action, toppling the two tallest aspens in the grove and decapitating them. When we arrived, they were dragging the trunks to their bonfire to keep it going for the rest of the night. To our surprise, their SUVs bore Colorado license plates, so their ill-mannered behavior couldn’t be blamed on ignorance. Not that ignorance was any defense. The large sign at the mouth of the gulch made it clear. How could they have missed it? No shooting, no chopping down trees, no food left out to attract bears. Our neighbors weren’t the only campers in the gulch who violated all three bans. At other campsites below us, boulders pinged and tree trunks crackled, as round after round struck its target, and smoke from a dozen bonfires drifted uphill, penetrating our tents. Our neighbors seemed polite enough; the sight of the ice axes wielded by two women old enough to be their grandmothers might have helped. They actually apologized for the noise, but by the time we crawled back into our sleeping bags, the shooting from somewhere close had erupted again. Earplugs were useless. The pop, pop, pop of bullets discharged in rapid succession rang out relentlessly, their capacity to terrify amplified by the echo chamber of the gulch. I nearly smothered myself with the down jacket I placed over my head. At midnight, the vet across the way drove away. He said his ex-wife would never forgive him if their boys were gunned down on a camping trip with Dad. I would have poked my head out of the tent to wish him well but I didn’t want to get caught in any crossfire. Our experience was not unique. During Fourth of July weekend in 2015, a grandfather was shot dead at a Forest Service campground near Woodland Park, Colorado, while sitting at his campfire, roasting marshmallows with his son-in-law. His daughter and three grandchildren were taking a walk, and though they were not injured, they had to endure the kind of horrific experience no one should have to endure. In news accounts about that incident, a Forest Service spokesperson reported a quintupling of shooting incidents over the previous two years. I tightened the drawstring on my bag, lowered my head to half-mast, and hugged the floor of the tent so hard, a foxhole might have opened up. At dawn, my head throbbed from lack of sleep — a hangover that would dog the entire hike. At 6 a.m., we made our escape, driving up the road to the trailhead for our ascent of a 13,000-foot peak. I’ll never camp in that gulch again. Here’s some advice to campers with guns: Leave your arsenal at home. You have nothing to fear but yourself. And think of those three kids who have to live with the memory of their bawling mom for the rest of their lives as she stood over her father, pleading for him to breathe. They never caught the shooter. Whether it was homicide or an accident, Granddad was dead.